Conversely, when the real part of b is positive then the system exhibits a subcritical Hopf bifurcation (Fig. 11b). For a < 0 there exists a single stable fixed point attractor (a spiral inset) and an unstable periodic orbit. Hence the phase space is partitioned: those initial conditions within the periodic orbit spiral in towards the fixed point; those initial conditions outside of the limit cycle diverge towards infinity. When a > 0, there exists an unstable fixed point (a spiral outset). Hence all initial conditions (except z = 0) diverge towards infinity. A subcritical Hopf bifurcation often occurs in the context of bistability, when there co-exists a large-amplitude limit cycle attractor. Above the bifurcation point a > 0, orbits diverge outwards from the fixed point repellor to this attractor. Below the bifurcation point a < 0, the limit cycle repellor (dashed blue curve in Fig. 11b) separates the basin boundaries of the fixed point attractor at the origin and the large-amplitude limit cycle attractor. In summary, Hopf bifurcations are of very high importance for an understanding of neural activity as they explain the onset and nature of oscillatory behaviour. Supercritical Hopf bifurcations lead to the appearance of small amplitude periodic oscillations. Subcritical Hopf bifurcations result immediately in a large amplitude limit cycle. Period-doubling bifurcations typically occur as a sequence of events subsequent to a Hopf bifurcation, following a further increase in the bifurcation parameter. The main panel in Fig. 7 shows period-doubling bifurcations in the logistic map between parameter values a ^3.0 and the onset of chaos at a ~3.5. The first period-doubling bifurcation (i.e. from a simple periodic oscillation to a period-2 oscillation) corresponds to the "excitation" of the limit cycle attractor into an invariant torus around which the attractor winds. Subsequent period-doubling bifurcations increase the number of times the attractor twists around the short axis of the torus every time it makes one complete revolution around the long axis. For a < 0 there are two fixed points, an attractor at -\J—a and a repellor at +v—a. As a approaches zero from below, these two fixed points hence approach each other and collide at a = 0. At this point, the fixed point, at z = 0, is attracting for z < 0 and repelling for z > 0. Hence it is neither an attractor nor a repellor, but rather a special ("non-hyperbolic") fixed point called a "saddle-node". The saddle node is classified as a local bifurcation because the two fixed points lose their asymptotic stability when they collide at a = 0. However, at a > 0 there is no fixed point - i.e. there is also a loss of structural stability. Hence it also meets the criteria for a global bifurcation. A recently described phenomena is the blowout bifurcation (Ott & Sommerer 1994). Suppose we have two (n-dimensional) neural systems zi(t) and z2(t) evolving according to (11), each with chaotic dynamics. In the instance where there is no coupling (c = 0), the system as a whole explores the full phase space R"xR". When the system is strongly coupled (c > ck for some threshold coupling strength ck), then the two systems will synchronize (Fujisaka & Yamada 1983, Pecora & Carroll 1990). In this case, the dynamics are confined to the 'hyper-diagonal' - that is, the space z1(t) = z2(t) of half the dimension of the full phase space. If the coupling strength c falls below ck the dynamics of the two-cell system "blowout" from the low dimensional state of synchronization, into the full state space, as shown in Fig. 13. Alternatively, it can be said that when c > ck the state of synchronization has asymptotic stability. When c crosses ck from above, the system loses stability in the direction transverse to the hyper-diagonal (Ashwin et al. 1996). Looking at the blowout bifurcation as c crosses ck from below (i.e. as the coupling strength is increased) we see that - through the process of synchronization - the dynamics of the system collapse onto a (relatively) low dimensional manifold. That is, synchronization constrains the number of degrees of freedom of a spatially distributed dynamical system. Whereas local bifurcations deal with the loss of asymptotic stability of fixed points - and are hence concerned with the dynamics in local neighborhoods of attractors - global bifurcations can only be understood by studying the properties of the vector field outside of such neighborhoods. They occur when an attractor loses structural stability. 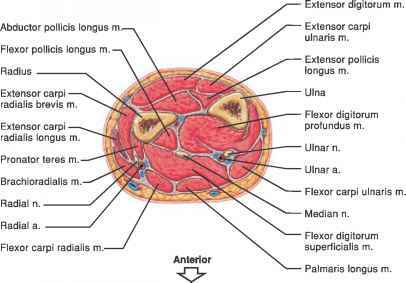 Their nature depends upon the "skeleton" of the phase space - the nullclines, homoclines and heteroclines. As stated above, a saddle-node bifurcation does have the properties of both a local and a global bifurcation in that there is no fixed point for a > 0. Looking at Fig. 12, we see that there are two fixed points when a < 0, an attractor at -\J—a and a repellor at +%/— a. The latter forms the boundary of the basin for the former. Hence the bifurcation occurs when the attractor collides with its basin boundary. This collision illustrates the principles of more complex global bifurcations. An example, when a chaotic attractor collides with its fractal basin boundary was termed a crisis bifurcation when it was first described (Celso et al. 1982). More specifically, a boundary crisis occurs when the collision is between an attractor and a boundary, whereas an interior crisis results from the collision between an attractor and a saddle. 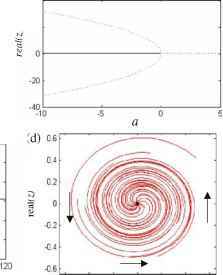 The former results in the sudden loss of an attractor and its basin, whereas the latter typically leads to the sudden increase in the extent of the attractor.